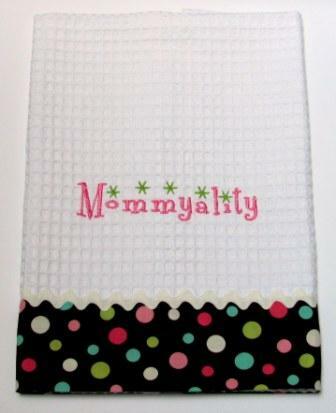 Mommyality is excited to host our very first giveaway! 1) Leave us a comment! It’s as simple as that . Or, visit Shams & Coverups Etsy shop to find your favorite item. Post a comment for an entry. Emili loves the comments and gushes with butterflies and happiness. 2) Like us on Facebook (right sidebar) or share this giveaway on Facebook or Twitter and post a comment below to let us know. 3) Follow us on Networked Blogs (right sidebar). Post a comment to let us know! Please leave a comment for each entry you have completed. Item number one must be completed to be entered in this giveaway. 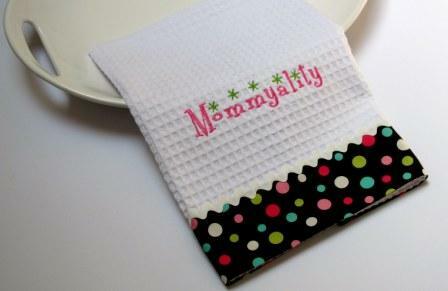 This absorbent lint free white cotton waffle weave kitchen towel was sewn, embroidered and donated as a giveaway for Mommyality by Shams & Coverups (Emili is part owner and contributor to this blog). It is embellished with coordinating polka dot cotton fabric trim and white rick rack. It also has a cotton twill loop on the back so it can hang from any hook in your kitchen. Machine washable. Retail value $14.00 USD. Giveaway open to residents of US only and ends on 08/31/2010 at 11:59pm EST. A winner will be chosen with random.org. The winner will be notified by email (if available) and posted on this blog. Winner will have 48 hours to claim the giveaway or a new winner will be chosen. Good luck! The Bean Counter: I think Haley would love this. Thanks for the idea. Always looking for inexpensive ways to have fun with a toddler. very cute towel. would love to be the winner! oh and btw love, love the site as well! Hi ya’ll. What a cute towel. I’d love to be entered in your first giveaway. Thanks for the chance. I just liked you on facebook. Thanks for another chance to win.